BU gained its third commitment in the past month from a high-end 2001 birthdate player, as Shattuck St. Mary’s defenseman Braden Doyle tweeted his commitment. The 5-10 left-shot blueliner from Lynnfield, Mass., who has a 7-23-30 scoring line in 35 games, joins fellow 2001s Robert Mastrosimone and Case McCarthy as future Terriers. He reportedly made his decision between BU and BC. 01 D Braden Doyle (@shattuckstmarys U14) commits to BU. Really nice add, MA native has 23 pts, great skater, super aware, quick, creates. Braden Doyle, #8 East Coast Selects, ’01 – A high-end defenseman in all aspects of the game, Doyle skates well, passes the puck crisply and accurately, and can shoot it. He’s poised with the puck in his defensive zone and has the ability to beat defenders with a pass or his feet. Played for the Minuteman Flames last year and will be heading to Shattuck-St. Mary’s this fall. 01 D Braden Doyle – Shattuck-St. Mary’s U14: Very offensively aware, makes the right play most of the time, at the right times. Utilizes deception in possession effectively and makes decisive reads all over the ice. Processes the game as it develops at a good clip compared to some of the best in his age group. He can really skate, too, as you’ll see when his top speed is needed to prevent a chance in the video below. Doyle caps off another outstanding year for BU, have a great start in 01 age (2 D, 1 F) and a lot of talent among their 00s right now. Alongtheboards.com looks at the key question facing each Hockey East team as the second half of the season begins. Team USA routed Switzerland, 10-1 today. While none of the Terriers registered points, both Brandon Fortunato and Charlie McAvoy were +3. Forsbacka Karlsson had an assist in Sweden’s 5-0 blanking of Denmark. 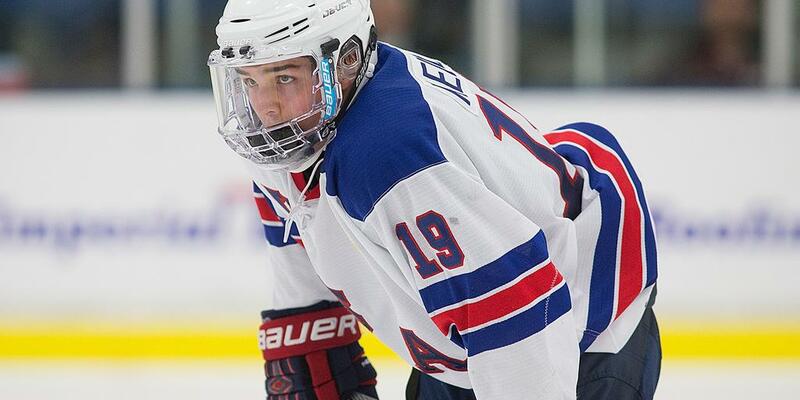 2016 recruits Clayton Keller (photo) and Kieffer Bellows each recorded an assist as the NTDP U18's defeated the Chicago Steel, 5-2. Fellow recruit Jake Oettinger made 21 saves to gain his 14th win in 18 decisions to go with a 2.33 GAA. Keller, who was the final forward cut from the Junior National Team, leads the team in scoring with 56 points, while Bellows is the top goal-scorer with 24. 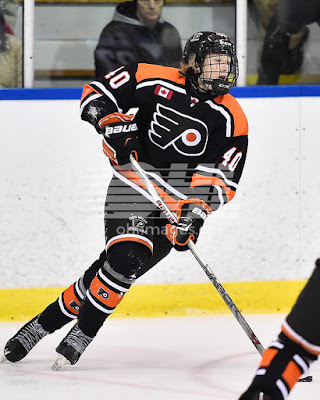 In the Don Mills Flyers' last game before the holiday break, 2018 recruit Tyler Weiss scored a goal and two assists to lead the Flyers past Markham, 4-1. The left-shot forward, who has scored seven goals in his last seven games, has a 13-11-24 scoring line in 15 games. A pair of All-Americans from BU’s 2009 national championship squad, Kevin Shattenkirk (Blues) and Colin Wilson (Predators) faced off in St. Louis last night with each scoring a goal in a game won by the Blues, 4-3, in overtime. Shattenkirk’s sixth goal of the season gave St. Louis a 3-1 lead early in the third period. Wilson (photo), playing his 400th NHL game, scored late in the period to knot the score and force overtime. Jack Eichel assisted on both Buffalo goals in the Sabres' 5-2 loss to first-place Washington. Eichel, who earned third-star honors, has 22 points this season, including eight in his last five games. BU has made its second mid-season roster addition as quick, skilled left wing Erik Udahl announced he’s coming aboard. A 1996 birthdate, the 5’8”, 165 pound Walpole, Massachusetts native has been skating for the BCHL Coquitlam Express with a 7-4-11 scoring line in 33 games. Earlier this month, BU added Swedish wing Oskar Andren, who had been playing for the NAHL Lone Star Brahmas. Udahl spent the 2011-12 season at The Rivers School, playing for former Terrier All-American Shawn McEachern, before joining the Tier 1 Boston Advantage program for two campaigns, scoring 54 points for the U16 team and then 39 for the U18s. 5. Erik Udahl, F, 3/31/96 (#7/Boston Advantage) 5-9/175 -- Udahl was one of the best forwards in the U18 division this weekend. Had a spectacular game in a 3-2 overtime win over Victory Honda. Udahl carried the puck over the blue line and bought time and space for himself, finding a teammate coming late to tie the game in the third period. He followed that up by tipping in the game-winning goal on a shot from the point. The knock on Udahl has always been his size, but he may be a nice energy player for a team willing to take a chance. Played at Rivers before going to the Boston Advantage last year. 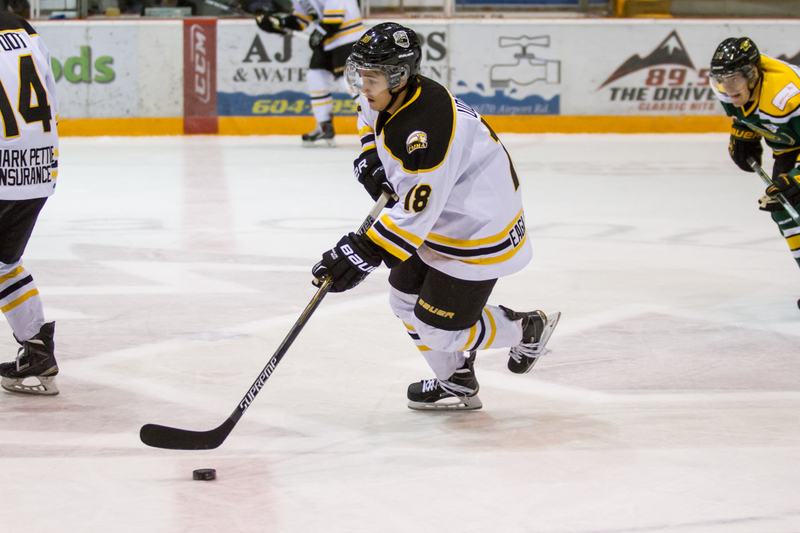 Last season, Udahl played for the BCHL Langley Rivermen, scoring 19 points. Charlie Coyle's ninth goal of the season helped Minnesota defeat the Red Wings, 3-1. Coyle, who earned second-star honors, has 17 points in 34 games. The Penguins' NCAA alums, including Nick Bonino, talk about their experiences playing college hockey. Former BU captain Wade Megan scored his third goal of the season as AHL Portland defeated Springfield, 5-1. 2018 recruit Jake Wise was named to the All-Tournament team at the Pete Frates Classic. Wise has a 7-7-14 scoring line in six games. Team USA scored three times in the third period to pull away from Canada for a 4-2 win. It was the first preliminary round game for both teams. None of the four Terriers (three current, one future) registered points. Brandon Fortunato and Charlie McAvoy were both +1, while 2016 recruit Chad Krys was -1. Brandon Hickey, skating for Team Canada was -1. 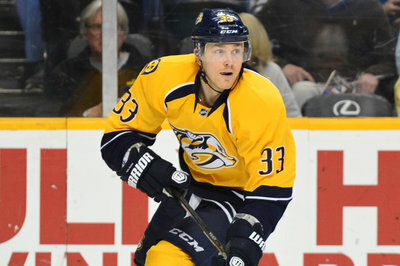 Jakob Forsbacka Karlsson scored a goal on a great individual effort as Sweden thumped Switzerland, 8-3. ► Team USA takes on Sweden on Monday with puck drop set for 9 AM ET. NHL Network will air the game live. Jack Eichel recorded an NHL career-best night with four points—two goals and two assists—as Buffalo doubled up the Bruins, 6-3 in the All American and Hobey Baker Award winner’s first visit to TD Garden since last season. Both goals came in the third period: the first on a deflection off a defender’s skate and the second on a 150 foot shot into the empty net when Boston pulled its goalie. Eichel, who earned first-star honors, now has 20 points (11G, 9A) in 35 games. 2018 recruit Jake Wise scored a pair of goals for Central Catholic, but the Raiders fell in overtime, 4-3, to Pope Paul in the Pete Frates Classic in North Andover. Wise, who scored 16 goals and 26 assists as a freshman to earn SB Nation’s Massachusetts High School Rookie of the Year honors, is one of the top US skaters among ’00 birthdates. He’s expected to join the NTDP U17s next season and was a guest of USA Hockey at Agganis Arena earlier this year when the U18s played BU.